When it comes to eating vegetarian food, Lao Beng is a complete noob as he is most of the time a carnivore. 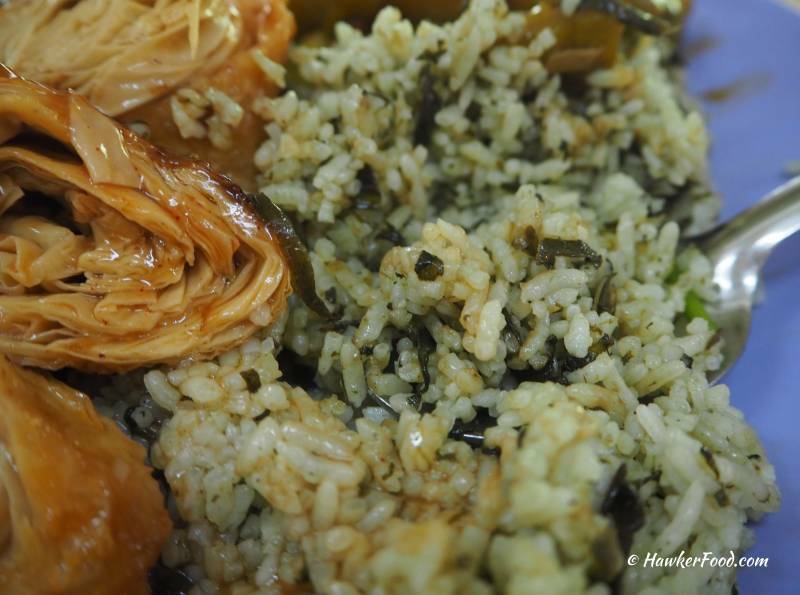 I was scouring for food in Bishan one late morning and could not find anything I like. 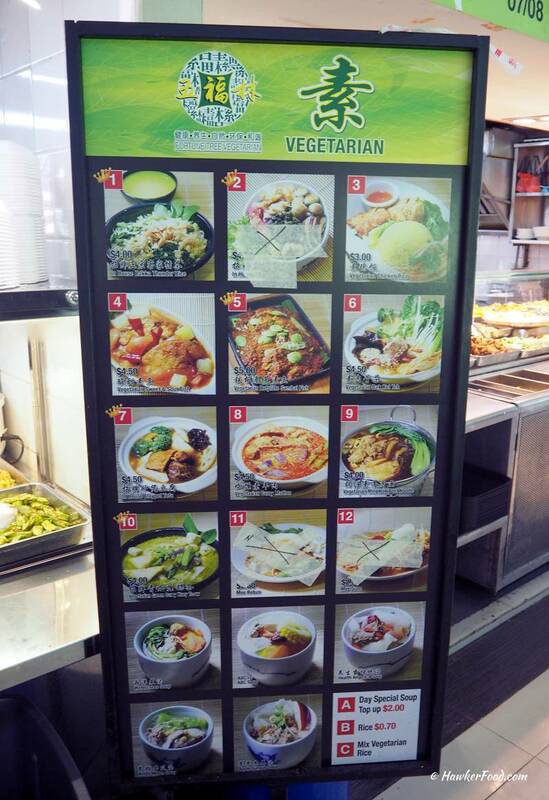 I had a hard time locating the vegetarian stall name until I saw the very small print “Fortune Tree Vegetarian”. 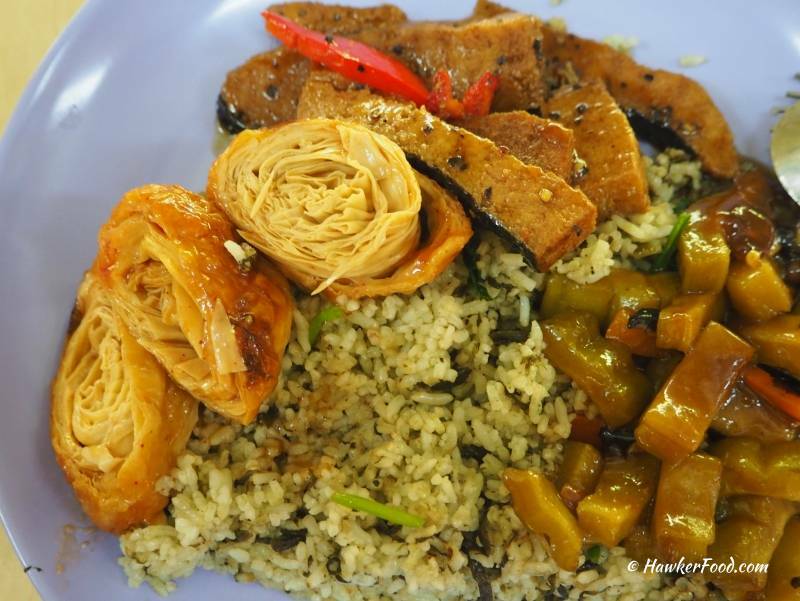 Other than the choice of mixing and matching the cooked dishes, they also offer other ala carte choices in the form of Hakka thunder tea rice, vegetarian chicken rice and vegetarian versions of sweet and sour fish, hotplate sambal fish and many others. 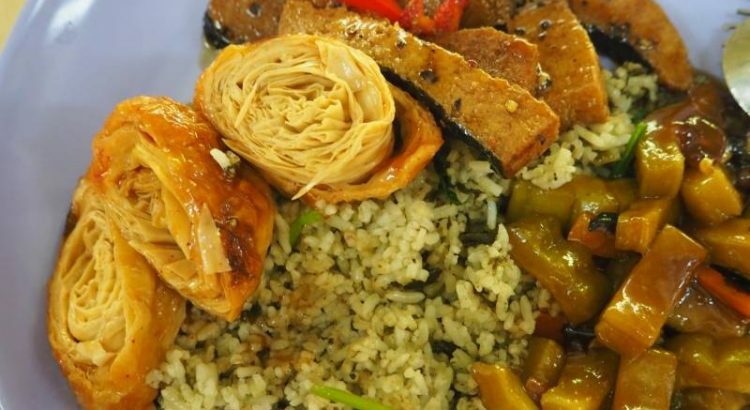 I decided to switch my attention to their cooked dishes and was attracted to the olive rice and some of the mock dishes. Honestly, I could not really name the various mock dishes unless they bear an exact resemblance to their meat versions like for example the char siew which is the most evident amongst all. After asking for olive rice, I chose bitter gourd, mock fish and mock ngoh hiang (wild guess of mine, but it is definitely made from bean curd skin). Basically for vegetarian dishes, the mock versions of meat are usually made from wheat gluten or from soy products. I forgotten how much it cost exactly due to my “zombiefied” brain that particular day but it should be approximately $4. The rice smelled good, was not greasy and I could taste the nice sour taste of the olive infused rice. The mock fish and ngoh hiang were pretty standard just like any other vegetarian stall but the bitter gourd was very very nice! Cooked with fermented bean paste, the bitter gourd was sweet and bursting with flavours; it was probably the best bitter gourd dish I ever tasted. Now, when I think back of the bitter gourd dish that I had eaten at regular economy rice stalls; those are a far far cry to the standards over at Fortune Tree Vegetarian. 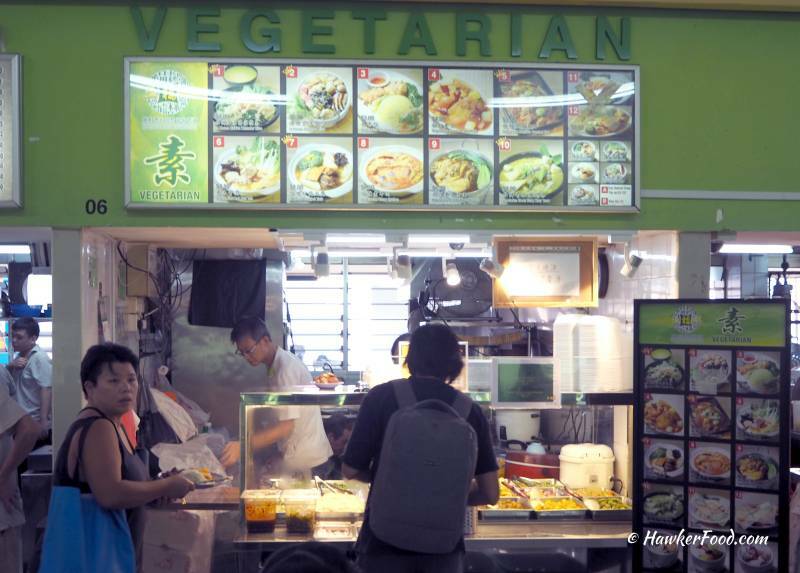 A good vegetarian stall in Bishan with plentiful of choices for Vegetarians and Non-Vegetarians alike, do give Fortune Tree Vegetarian a try today.